In a small bicycle shop in Dayton, Ohio, the Wright brothers made a discovery that would forever change the history of the world. This small bicycle shop still stands today, thanks the conservation efforts of community nonprofits, local leaders, veterans, and countless volunteers. As a result of these grassroots efforts, National Aviation Heritage Area was designated by congress in 2004, encompassing sites related to the history of aviation, including the Dayton Aviation Heritage National Historic Park, operated by the National Park Service. Any flight aficionado would do well to pay a visit to Dayton, the birthplace of aviation. The aviation tour follows the incredible history of the Wright brothers discovery of flight. It includes over 16 historical sites, interpretive centers, and museums dedicated to aviation. According to NASA, 25 astronauts have called Ohio home, among them John Glenn and Neil Armstrong. It is no wonder that Dayton continues to inspire people to explore its rich history. The 1905 Flyer, Flyer III, the world's first practical plane, which was restored under the direction of Orville Wright himself, can still be viewed at Carillon Historical Park in Dayton - a stop on the aviation tour. We lived in Cincinnati, Ohio last year, and we completed the aviation tour over the course of a few months. We took this tour to teach our children the amazing power of innovation and history of flight. The planes and historical artifacts on this tour are impressive to say the least. One of the most interesting aspects of visiting these volunteer-run museums, is the opportunity to speak with individuals who give countless hours of their time and energy to preserve this important history for future generations. Many of the sites on the aviation tour are free, and a few have a small fee. Below you will find a list of the sites on the tour, including our family photos, and interesting historical facts pertaining to each site. The significance of this tour is that it is a complete collection of historical data including an array of sources - first-hand historical artifacts, collections of scientific information, memorabilia, photos, oral history, and one of the largest collections of planes in the world. Taken together, this historical tour connects the dots of US aviation history and world history related to flight. In the late 19th and early 20th centuries, Dayton was considered a hub of innovation in American history - inventions like the cash register, self-starting ignition, the parachute, steel furnace, and the movie projector - just to name a few, all came together here. Many consider Dayton the silicon valley of its time, thanks to countless industrial technologies that shaped and refined the industrial age. Engineers and thinkers congregated in Dayton to exchange ideas. One can still feel connected to this history thanks to nonprofit organizations and community leaders who work to preserve the area's historical sites and make them accessible to families. 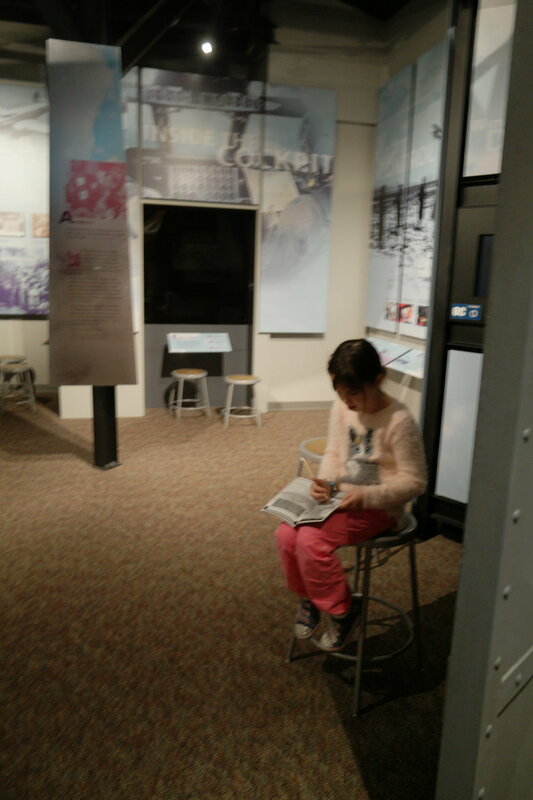 For children, this tour provides excellent learning opportunities with interactive exhibits. Some sites on the tour are part of the Junior Ranger Program and kids can earn a different badges if they complete a booklet of their learning. I suggest completing all of these and splitting them into different weekends by themes. For example, the National Air Force Museum could easily fill one entire weekend in itself. If you are visiting the area from out of state, I highly recommend looking at the map to maximize your time and deciding beforehand which sites to visit. 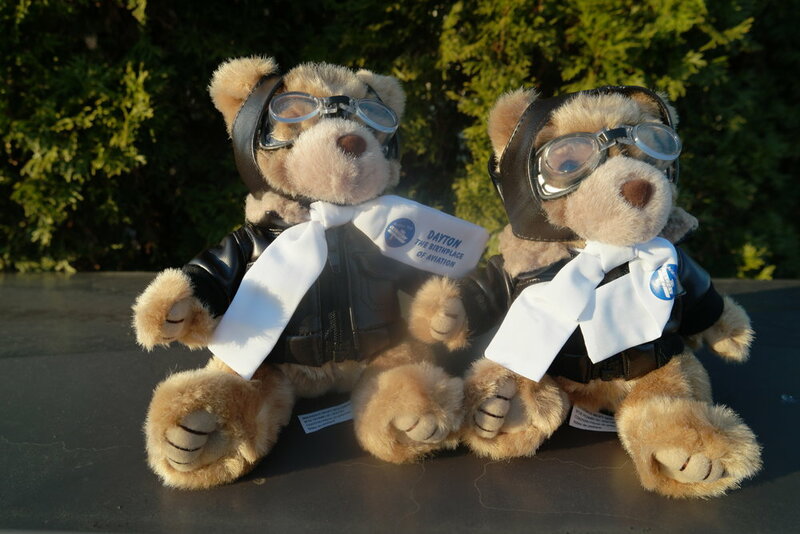 Another interesting thing for kids is the "Wilbear Wright" Aviation Trail passport. 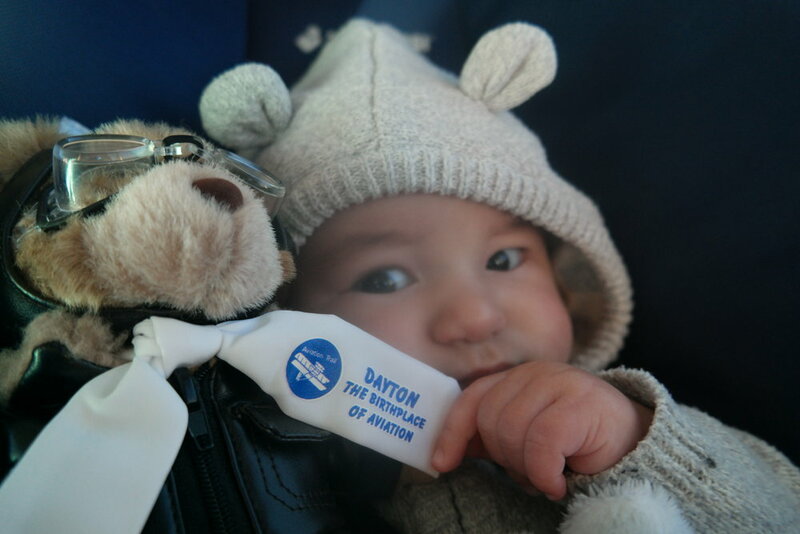 If kids tour at least 7 of the 14 sites listed in the passport brochure on the aviation trail, they can earn stamps for each visit and qualify for a free "Wilbear Wright" aviation teddy bear. There are 4 locations where you register for this the Wilbear Wright program and start the tour. It is best to plan your route by taking a look at an area map (provided in the brochure or NPS site). If you are traveling during holidays, is best to call ahead or check hours on the websites of each site when planning a visit (I've included the websites links for each site below). 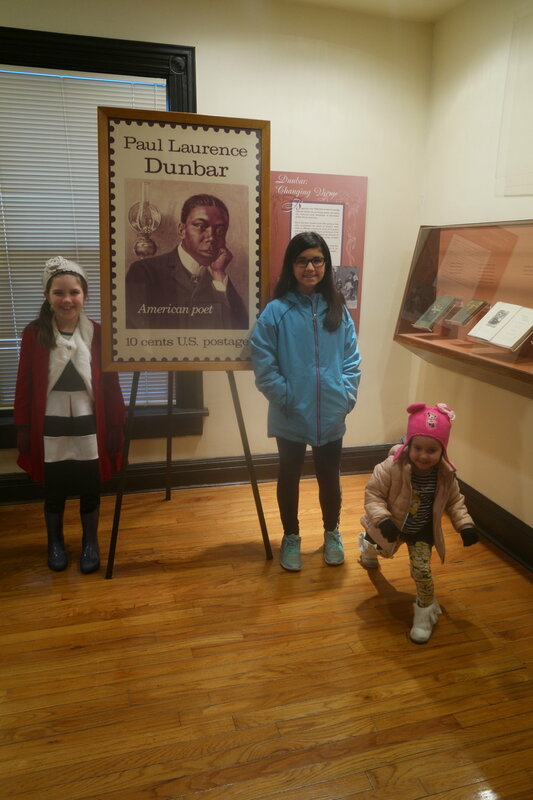 Our tour began at the Wright-Dunbar Interpretive Center, named after African-American poet laureate, Paul Laurence Dunbar, a friend and business partner of the Wrights. It is the second location of the Wright's first business - a printing shop. This site is part of the "West side neighborhood", where the Wrights lived, and began their careers publishing newspapers for patrons, including Dunbar's paper, "the Daily Tatter." West Third Street was added as a National Register Historic District in 1988. 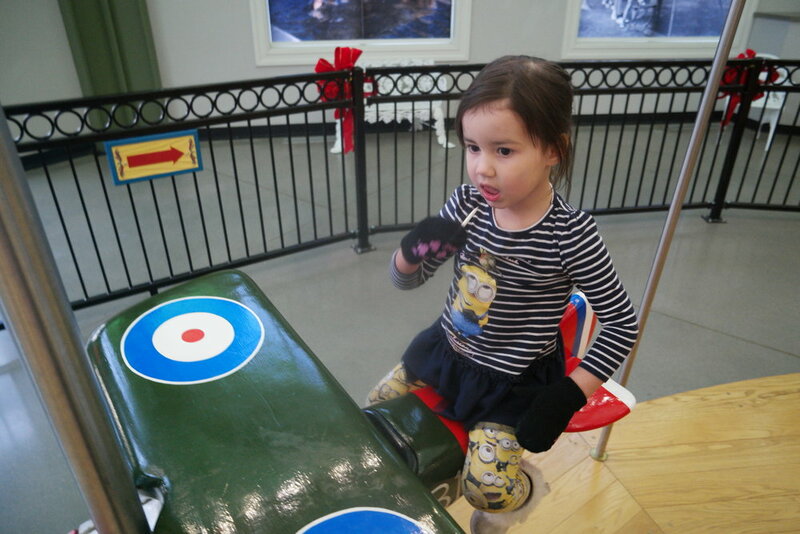 The interpretive center allows children to participate in a Junior Ranger Program examining historical artifacts, family history, engineering knowledge, and timelines related to Dayton's aviation history. The exhibits relied on STEM connections directly applicable to physics, math, engineering, mechanics, and architecture. I hold a MA in teaching elementary education, and I can easily say that these learning exhibits were of very high caliber-because they relied on multiple intelligences while appealing to different ages groups and interests. Every kid will find something they love on this tour-even my 2 year old found exhibits on this tour that she did not want to leave! The rangers are very approachable and will explain the learning brochure & answer any questions about the program. The Parachute Museum highlights Dayton's key role in developing the parachute. My kids especially loved seeing how parachutes work, and taking funny pictures in the pilot mockup and feeling air resistance meant to mimic that of free falling on a parachute. 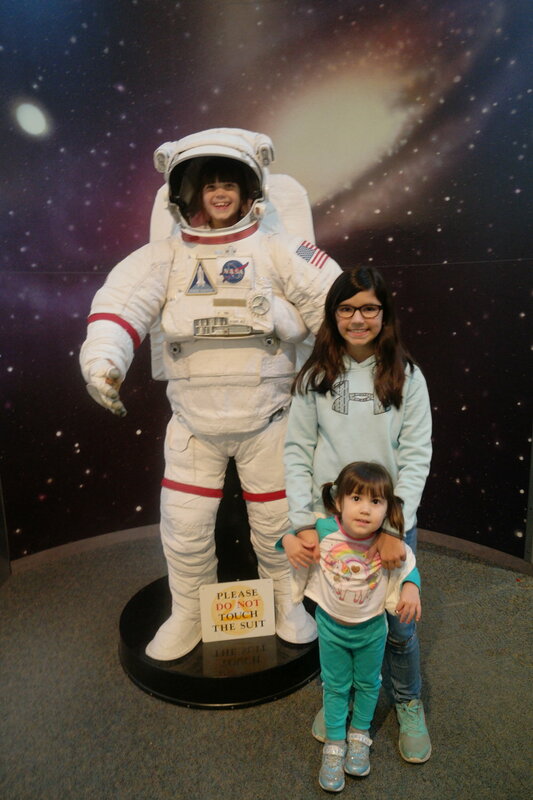 This museum (on par with majority of the exhibits on the aviation trail) is extremely kid-friendly, but is also interesting for adults, as there is a great deal of specific historic and scientific information provided. According to Anne Armstrong Ingoldsby of Aviation Trail Inc, "The David Gold Parachute Collection, is considered one of the most comprehensive private parachute collections in the world. Upon Gold’s death in 1985 his estate donated his collection to Aviation Trail, Inc. The books, papers, reports, photographs and films were sent to nearby Wright State University Special Collections and Archives of the university’s Paul Laurence Dunbar Library. The museum covers the parachute world development in Dayton. Visitors can experience ejecting from an F-16 fighter jet, parachuting from the world’s highest altitude, feel the physics of air that makes a parachute work, see and feel the resistance of air in free fall, go along with the first pilot to do an emergency free fall from his failing aircraft . . ."
Right across from the Wright-Dunbar Interpretive Center, stands the original Wright Cycle Company building which has been restored, still standing in its original location. Here, the Wrights manufactured bikes on the first floor, and operated a printing press on the second floor from 1895 to 1897. In this building, the Wright brothers came up with the first ideas for their Flyer I. The building was acquired by the National Park Service in 1992 and is free to tour. This site was very easy for kids to understand, and they enjoyed seeing the exhibit showing how the bicycle shop easily doubled as an engineering shop. I especially like the accessibility of this exhibit in teaching kids how innovations begin, and their applications in real life contexts. What started as a dream became a reality here. This is easy to see in the bicycle shop and it encourages kids to dream. The Huffman Prairie Flying Field is the exact site where the Wright brothers tested their planes after the historic first flights at Kitty Hawk, North Carolina in 1903. Instead of relying on wind, here the Wright brothers tested a catapult system. The field is named after banker Torrence Huffman, who allowed the Wright brothers to use their field for free (NPS). This field survives in its original state and is listed on the National Register of Historic Places and is a National Historic Landmark. In this field, the Wright brothers continued to test their planes in 1904 and 1905. Here, they set world records testing the Flyer II and continued improving the design leading to the world's first practical plane, the Flyer III. 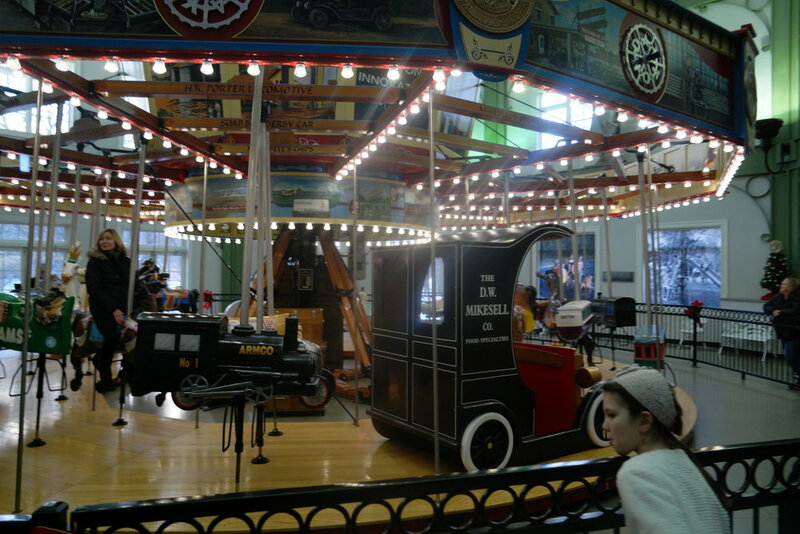 (The original, restored Flyer III is on display in Carillon Park). You can walk along the field on a paved trail and really appreciate how this history came to be. Standing in this field, I got goosebumps. I was taken aback emotionally, because it was easy for me to envision this amazing feat in human innovation firsthand. The field contains a mockup of the hanger where the Wright brothers stored their planes with information about the crowds that gathered here for exhibitions and inside you can find an interactive exhibit about the development of the rudder. You can also see an amazing mockup of the catapult tower used to launch their planes on the field. You will also find the small creek and train stop, 'Simms Road Station' behind the field, which the Wright brothers conveniently took to their home each day after testing their planes. From 1910-1916, the Wright Company ran a flight school and trained their exhibition team on this very field. If you are interested in the history of flight, this field is a must-see, it is essentially the world's first airport! This comprehensive learning center focuses on the history of flight, exploring the concepts the Wright brothers tested at nearby Huffman Prairie field, including the experimental flights leading to the development of the Flyer III, the world's first practical plane. Kids can participate in the Junior Ranger program here as well, and earn a their 'wings' badge. Some of the exhibits at this center, detail the history of Wright-Patterson Air Force Base, from its beginnings in WWI. The Park Rangers at all the different interpretive centers on this trail, eagerly provide a wealth of information about the history of aviation and the local area. This memorial, dedicated by the citizens of Dayton, overlooks Huffman Prairie Flying Field. A plaque commemorates 119 pilots who trained on this field. Orville Wright himself was able to see this memorial as a guest in 1940. The National Museum of the United States Air Force is an icon of National Aviation Heritage and a repository of national treasures. To say this museum is large is an understatement. It has over a million square feet, not including the outdoor Air Park and Memorial Garden. ( I wrote a separate blog specifically about this museum, which you can find by clicking here). According to its website, the museum is "the oldest and largest military aviation museum in the world." It is located at the Wright-Patterson Air Force Base, near Dayton, Ohio. The galleries are formulated around historical events, so that the planes and artifacts, tell a story of our nation's history in each major war. There is a strong emphasis on the history of flight, innovation and space exploration, as these are also directly correlated to the history of the US Air Force. Each gallery is supported by historical information from the time period, such as newspaper articles, photos, films, related artifacts, and aviators' personal stories. My husband is a veteran and this museum allowed him to explain the military's role in US and world history - the exhibits really draw children into wanting to learn more details about these notable historical periods, that otherwise would be very difficult to explain without visual and interactive aides. Well-organized galleries in a series of connected hangers, tell the history of innovation relating to flight, such as those related to early flight with example aircraft in each hanger, including WWI, WWII, space exploration, the Cold War, and R&D galleries. In addition the museum exhibits 9 Presidential aircraft and a outdoor memorial garden commemorating Air Force units that served in various conflicts. The museum features an IMAX theater, an amazing gift shop, and cafeteria. United States Air Force Museum, Interactive exhibit of a Space Shuttle. My daughter picked up a WASP flight jacket at the National Air Force Museum Gift Shop, so she was excited to collected all of ranger patches to add to her jacket. We were also able to find the mission patch of a relative who was an astronaut - Michael R. Clifford on my husband's side, who shares our last name "Clifford," and we explained to her the significance of this family history. Inside the National Museum of the United States Air Force is a museum and research & learning center, dedicated to the heroic feats of aviation and space travel, documenting the story of the lives of service members and astronauts that impacted history. Since 1962, five inductees have been added each year. This gallery in the Harry B. Combs, Learning & Research Center features a wall with portraits and biographies of each inductee. The exhibit explains their history through interactive media, providing first-hand accounts of important aviation history. 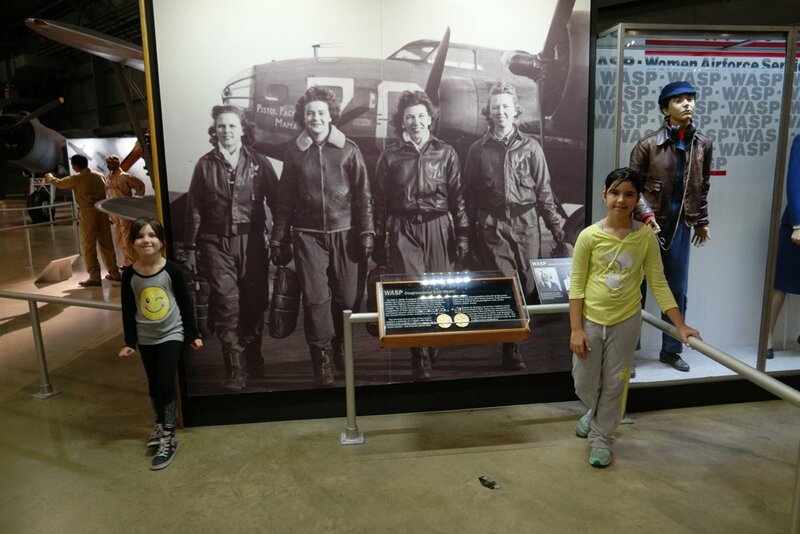 My children enjoyed learning about the lives of these heroes and heroines, and exploring important eras of US aviation history. The National Aviation Hall of Fame provides personal stories and highlights the lives of these incredible individuals and their contributions to aerospace feats. Carillon Historical Park is a 65-acre museum with 30 historical buildings; it opened in 1950 to showcase the region's contributions to innovation. At the turn of the 20th century, Dayton had more patents than any other city in the US. Here you can explore galleries related to Dayton's innovations & transportation history, such as the cash register, automobile starter, antique cars, an original horse-drawn stagecoach, and the 1835 B&O Steam locomotive. Indoor galleries feature the story of innovation-I was impressed by the beauty of the cash register gallery, and some of the pieces in the collections could now be considered works of art. Inside you will also find a miniature train display next to a very uniquely-themed carousel that has trains, planes, and automobiles relating to different eras of Dayton's history-it is beautiful and the kids loved it. There are outdoor galleries dedicated to the history of Dayton with historical photographs and area history, such as oral history relating to the Great Dayton Flood. One building completely explains the history of bicycles in the area-providing examples of different historical styles. There is also a functioning print shop - with restored equipment that still sells prints- commemorating Dayton's important historical role in publishing. And tour keeps going-you can even find original train cars from different time periods-which you can board and see inside. We visited during the annual Christmas celebration, which included carolers, Santa, special lighting of the outdoor area, homemade gingerbread cookies in a wooden stove, and a holiday train around the grounds. 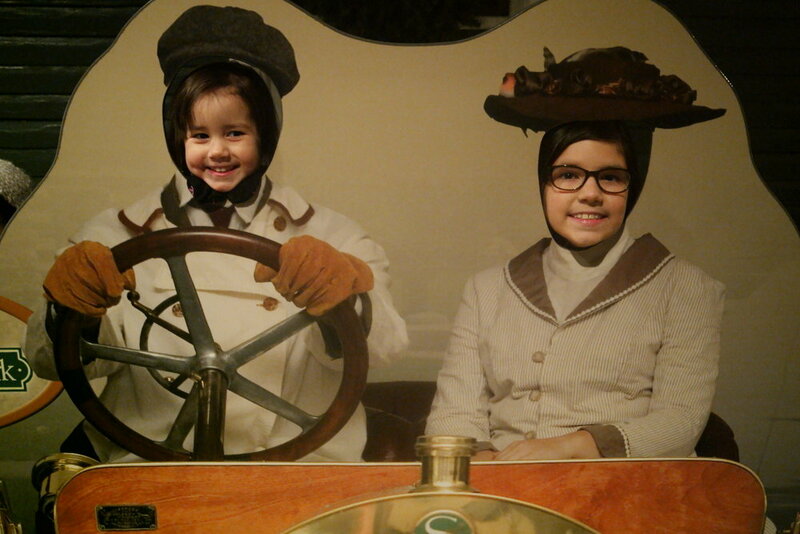 The kids really enjoyed the carousel, train displays, old cash register galleries, and the holiday activities. You will also find a brewing company on site, which features local brews and explains Dayton's brewing history beginning in the 1880's. 10. John W. Berry, Sr. Wright Brothers Aviation Center at Carillon Historical Park (see address of Carillon Historical Park above). Flyer III at Carillon Historical Park. The original 1905 Flyer III can be viewed in this exhibit, part of Carillon Historical Park. The Wright brothers considered this their most important plane, and it is the only plane designated a National Historical Landmark.This plane was restored under personal instruction from Orville Wright in the 1940's. Orville designed the exhibit to place the plane at ground level, so that people could see how the controls worked. My kids were able to see this plane and discuss its importance with incredibly dedicated volunteers, who were happy to give details about its construction. The volunteer also explained that the 1903 Flyer I is in on display at the National Air and Space Museum in Washington, DC. The exhibit also contains the most Wright brothers artifacts in the world, including the a Korona V Field Camera used at Kitty Hawk to film their first flight (Carillon Historical Park exhibit). You can also tour Orville Wright's mansion, located at this site (explained below). Here you can tour the mansion of Orville Wright, where he lived from 1914 until his death in 1948, and learn more about his life. 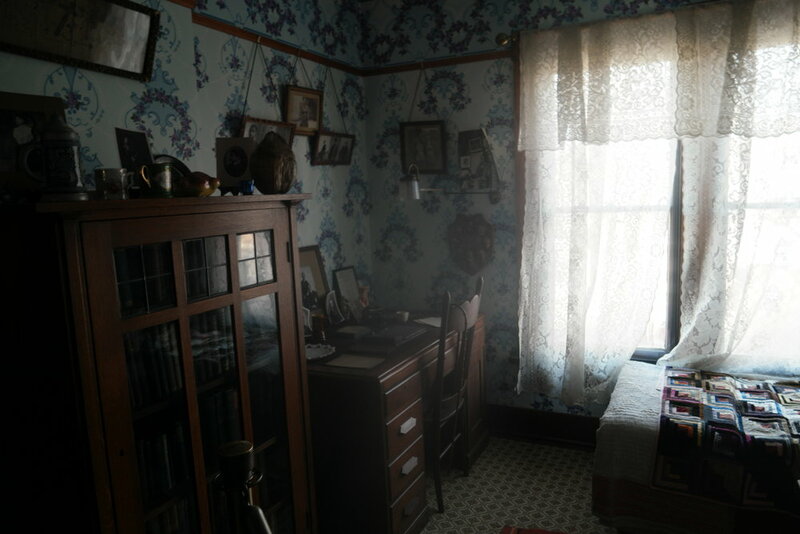 Famous contemporaries, including Thomas Edison, Charles Lindbergh, and Henry Ford visited Orville Wright in this home. Photographs of the Wrights' flights were acquired by the Library of Congress from Orville's estate. Wright State University, named after the Wright brothers, contains the most complete collection of Wright brother's history (including 4,000 photos documenting the invention of the airplane), as well as other aviation collections. Our family was greeted by a huge replica of the 1903 Wright Brothers' Flyer hands in the atrium. A friendly student pointed out some of Wright brothers memorabilia to my children, and explained its significance. The Wrights understood the importance of photographing their work. According to the Library of Congress, "Rarely in the history of science and technology is it possible to see, analyze, and study a crucial technology as it was developed, and the value of the Wrights' materials can be judged by imagining how historical understanding would be enlarged if photographs existed of ancient Roman, Renaissance, or even eighteenth-century technologies as they were being developed. "(LOC) See Library of Congress link here for more interesting info about the pictures. WACO Aircraft Company is a reminder of a bygone era in flight: it preserves the history of the largest manufacture of civil aircraft in the 1920's and early 30's. This airfield still hosts flights today, and you can even book short biplane flight in a beautiful plane (see info here), which would be great for a date! They will even pair single riders if you go solo. One section of the field is dedicated to flying remote-controlled planes. A learning center, particularly focused on STEM applications for kids, is currently in the works and will open soon. WACO hosts summer programs and many learning activities for kids. This museum restores WWII aircraft for public appreciation and honors the legacy of veterans contributions. Planes are kept in working condition, and volunteers work to restore and preserve them for future generations. 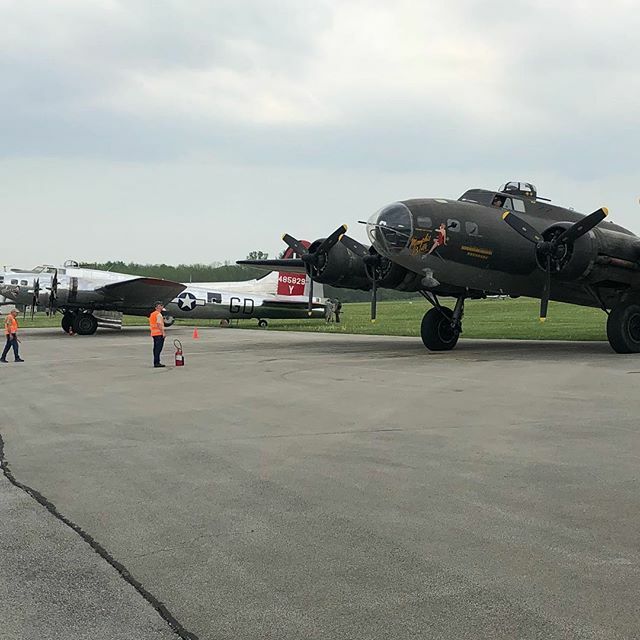 Aircraft on display include B-25N Mitchell, a C-47 Skytrain, an A-26 Invader, an S-10 and a 1939 Fairchild 24R, and most recently work is underway to preserve World War II bomber, B-17G Flying Fortress, Champaign lady, used in turbojet/propeller research. Perhaps one of the most interesting aspects of visiting these volunteer-run museums is talking to veterans and plane enthusiasts who give their time and energy to preserving this important part of US history for future generations to learn and appreciate. Their website contains photos of veterans and the planes they flew in combat. This site founded in 1841, sits on the top of a hill, providing a panoramic view of downtown Dayton, a fitting burial ground for the Wright brothers. Paul Laurence Dunbar and his mother are buried here as well. Another interesting fact about this cemetery, is that it is one of the country's oldest rural garden cemeteries, and home to thousands of trees, some of which are more than a century old. Nine trees found here have been designated "Ohio Champions" by the Ohio Forestry Association. This cemetery is on the National Register of Historic places, as it contains a Romanesque gateway and chapel featuring an original tiffany window. The monuments & burial plots dedicated to Dayton's inventors are interesting to view in the content of this city's history. Here you can schedule a visit and learn about Warren Grimes, the inventor of aircraft lighting, who was born in the same town as the Wright Brothers. Grimes Manufacturing company produced lights for military aviation, and today continues (Honeywell) its important role in providing lighting systems for transportation and aviation. The Grimes Flying Lab museum, allows you to see how engineers tested and designed lighting systems for planes. You will find a "C-45" plane, a version of the Beechcraft Model 18 that was used as a 'Flying Lab' to test nighttime lighting systems, improving the safety of air travel. At the end of the tour, we took our Wilbear Wright passports to the Park Ranger and collected our bears- our daughters and our son who was born soon after we completed the Trail now has a memory of the weekends we spent together as a family exploring the many sites on the trail. I would highly recommend this trip. My children used this trip as a "Personal Learning Day," which in our school district was a requirement that enabled students to design their own learning experience. Personally, I gained a deeper understanding of US history and an appreciation for our role in the innovation of the world that started with a dream. A dream that changed the world forever. "The Ohio Bureau of Motor Vehicle offers a special "Leader in Flight" license plate. Approximately one-third of our operating funds of the sale go to Wright "B" Flyer Inc. The Leader in Flight license plate program supports NAHA’s efforts to preserve and promote aviation heritage. The state contributes $15 of every registration to NAHA; half of that amount goes to its license plate program partner, Wright “B” Flyer Inc. Ohioans, show your pride in our aviation heritage and remind others that the Wright brothers invented powered flight in Ohio!" - Print a license plate application form for mailing. Or, order online.